The daughter of a British WW2 pilot has been convicted of assault on a teenager who she claimed had vandalised a memorial to war dead, the British Daily Mail newspaper reports. Last year after seeing one of a group of youths riding a bike through freshly-laid flower beds, Julie Lake tackled the one she believed to be the ringleader and gave him ‘a cuff round the ear’. She also threw a bicycle belonging to one of the youths into the road. 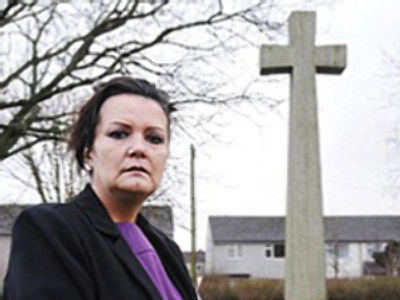 Although the woman claimed she was performing a moral obligation following months of anti-social behaviour and vandalism at the memorial, she was arrested several weeks later. On Wednesday she was found guilty of assault, criminal damage and a public order offence and sentenced to a 12-month conditional discharge. The judge rejected Lake’s claim that she was trying to perform a citizen’s arrest and concluded that the reason for her behaviour was that she lost her temper. Before her arrest Lake had said that she’d lost her temper after two years o ftrying to get something done about the regular acts of vandalism. The case has caused controversy. Lake’s lawyer Nick Freeman, famous for clearing celebrities, defended her for free following a massive public outcry. He said he didn’t feel that common sense had prevailed.